Ginchereau, who hails from Marlton, is now entering his junior year at Georgian Court University (GCU) and there’s no question he made the right choice. It has become a true second home for him, a place where he can interact with faculty and fellow students in an academic and social setting without falling through the cracks. Located in Lakewood, GCU sits on a 156-acre estate with stunning architecture and gardens flush with flora, and it is classified as both a National Arboretum Site and National Historic Landmark. The campus is just 10 miles from the Shore and 6 0 miles from New York City and Philadelphia. Founded by the Sisters of Mercy in 1908, GCU (then known as Mount Saint Mary College) provides a comprehensive liberal arts education rooted in the Catholic tradition. The university is open to all faiths, and is built on five co re values: justice, compassion, respect, integrity and service. 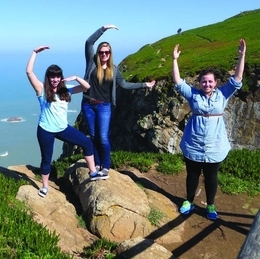 GCU offers opportunities for case studies and internships to give them real-world experience, as well as study abroad programs that can range from a full semester to a shorter one- to three-week trip, but even the classroom itself provides a unique experience, thanks in large part to the small class size. For example, Ginchereau, a history and education major, recently won an international scholarship to study abroad. He will spend this fall at St. Mary’s University in London. Just over 1,500 undergraduate and approximately 600 graduate students attend GCU. The average class size is 12 students to one professor. That intim ate class environment gives students the attention they need, without fear of being overlooked. “I would say there are an abundance of safety nets if a student is falling through the cracks,” says Ginchereau. “There are a lot of support services on campus, from counseling and health outreach to peer or professional tutoring, plus clubs and advocacy groups such as LGBTQ @ GCU. The clubs are student-centered, student-run and student-driven, and there are no barriers for entrance, so you aren’t competing to get in.” He has personally created safe space training on campus, which he worked to get funding on with faculty support. Students and faculty also have a commitment to the community, and GCU is undefeated in the NCAA Division II “Helper Helper” community service awards. Athletes last year logged more than 2,700 service hours with more than 20 nonprofits. Campus-wide, the figure jumps to 120,704 volunteer hours invested by all students, staff and faculty.